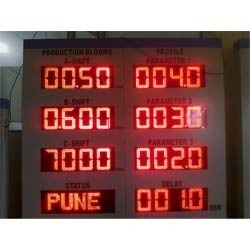 Manufacturer & Exporter of LED Display Systems. Our product range also comprises of Electric Arc Furnace, Rogowski Coils & Integrators and Fume Extraction Systems. Offered to clients at a market leading rate, the range of LED Display Systems made available by us, is widely acclaimed and asked for. Owing to the finest raw materials and technology applied, the offered range is known to have a superior performance and longer service life. In addition to this, the offered range is known to have its standard of quality highly maintained.